The Valletta skyline featuring St Paul's Cathedral. It’s easy to miss Malta on a world map. Comprising a handful of islands, anchored between Sicily and North Africa, the Maltese archipelago is so small that you could cram it into the city of Cairns. But don’t be fooled by its Lilliputian appearance. Blessed with an average of 300 sunny days a year and bundles of sightseeing potential, Malta is a fabulous alternative to the mega-hyped Mediterranean islands of Spain, Italy and Greece. Today’s sun and culture-seeking adventurers follow in the footsteps of Phoenician, Roman, Norman, Arab and British invaders, whose diverse influences flavour everything from Malta’s architecture and cuisine to its spoken word. To really appreciate Malta, make time for all three inhabited islands: Malta, Gozo and Comino. Four hours ago I was shivering in frosty London. Now I can feel the warm spring sun on my face, as Valletta, Malta’s pocket-sized capital, looms before me. Its mesmerising skyline of Baroque domes and spires rises above a chain of fortified walls and watchtowers, which, like so many Maltese buildings, were cobbled together from the archipelago’s honey-hued limestone. I’m enjoying this view from the public ferry crossing, Marsamxett Harbour. 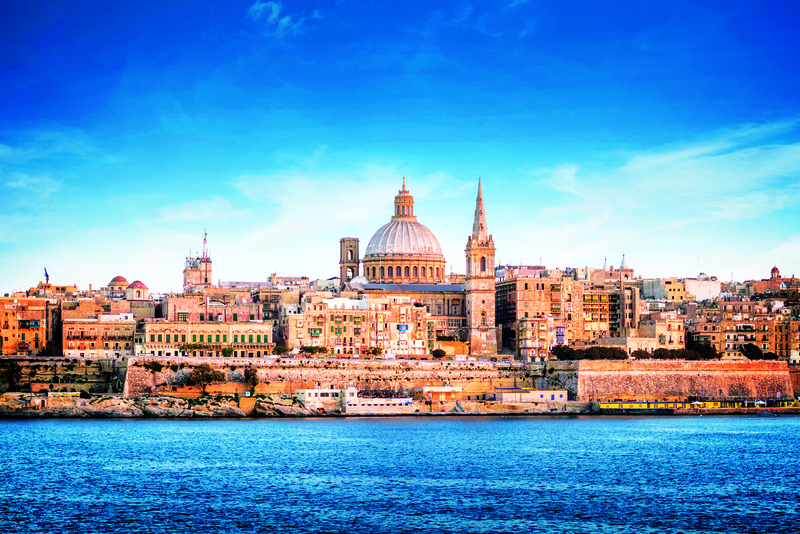 It links the western shores of Valletta with the trendy seaside town of Sliema (whose range of hotels, shopping, cocktail bars and seafood restaurants make it a desirable base for travellers). Dreamy from afar, Valletta’s hilly grid of narrow streets and alleys is a treat to explore. Strewn with slopes and stairways, the city is punctuated with aristocratic palaces, archaeology museums and a lavish cathedral decorated with gilded ornaments, marble sculptures and masterpieces by the volatile Italian painter Caravaggio. Despite its antique aura, Valletta is young by Maltese standards. It was founded in AD1566 after ‘The Great Siege’ – a bloody battle that saw native Maltese and the Knights of the Order of St John (a pan-European Christian crusader society) repel the rampaging navies of the Ottoman Empire. The country’s turbulent past is charted at the Malta Experience, an audio-visual show set in an auditorium near the bastions on Valletta’s northern tip. I’m moved by heroic tales of Maltese resistance to the equally brutal Nazi and Italian bombing raids – a feat that earned the whole country the George Cross for bravery and helped swing World War II in the Allies’ favour. 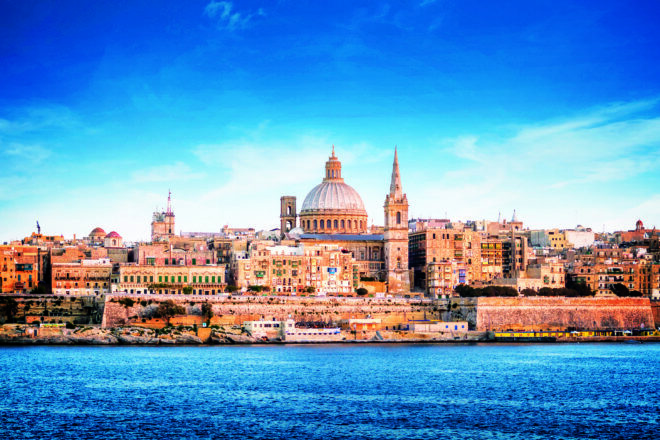 Later, I chill out in the Upper Barrakka Gardens, where an arcaded terrace, studded with palm trees, overlooks Valletta’s Grand Harbour – the deep, cruise ship-and-crane-packed port to the city’s east. The wonderful thing about Valletta is that, unlike many other UNESCO World Heritage sites, it’s not a stilted open-air museum. About 6000 people live in the historic core, and its earthy backstreets buzz with market traders hawking fruit and veg in Maltese, and septuagenarian ladies sweeping pavements beneath prominent wooden balconies draped in fluttering laundry. There are vivacious pizzerias and trattorias and myriad hole-in-the-wall bakeries, where I snack on pastizzi (small parcels of flaky pastry stuffed with goat’s cheese or peas). As I’m window-shopping family-run shoe stores and jewellers, I stumble across intriguing watering holes, like The Pub. Dubbed ‘Ollie’s Last Pub’, this was where hell-raising actor Oliver Reed had his last-ever tipple in 1999. He’d reportedly been drinking rum and arm-wrestling young sailors when he took ill. He died on his way to hospital. Reed had been shooting scenes for Gladiator, one of several movies filmed (or part-filmed) on Malta. Others include Midnight Express, The Da Vinci Code, Munich, Troy, Alexander and, interestingly, Popeye, the 1980 musical starring a spinach-fuelled Robin Williams. Entertainers masquerade as Popeye, Olive Oyl and Bluto at Popeye Village, a ‘fun park’ that has grown around the original film set in the north. Far more alluring for me, however, are the Three Cities: Vittoriosa, Cospicua and Senglea. Facing Valletta over the Grand Harbour, this elegant trio is made for sauntering. So, too, is Mdina, an atmospheric hill-top walled town at the island’s centre. A labyrinth of car-free lanes spring off from Mdina’s St Paul’s Cathedral; built on the spot where Publius, the Roman governor, apparently received St Paul after he was shipwrecked on the island in AD60. Publius converted to Christianity, becoming the first bishop of Malta, and the country has remained devoutly Catholic ever since. Every parish has its own saint, which it venerates during its annual calendar of festivals (festas). One of the liveliest is at Marsaxlokk, a quaint fishing village renowned for its zesty Sunday fish market, where locals and tourists rub shoulders, nosing – and sampling – an array of tuna, octopus, prawns, mussels and dolphin fish (known as lampuki). This is music to my ears as I plan to cycle around Gozo, a rustic, myth-drenched island even tinier than Manhattan. Alas, reality isn’t quite as idyllic as my daydreams – at least not when I’m ascending Gozo’s devilishly steep hills. It is bliss, however, to whoosh towards the deep-blue Mediterranean Sea, past patchwork terraced fields of wheat, tomatoes, olives and grapes. I pedal, languidly, past farmhouses (some hosting eco-friendly B&Bs), and along sleepy lanes lined with villas whose decorative wooden signs read names like ‘St Joseph’s’ and ‘Lily Vally’ beside wrought-iron grilles flecked with bougainvillea and geraniums. All roads in Gozo lead to Victoria, which is crowned by a Mdina-like citadel. Its market stalls are laden with Gozitan lace, knitwear and trinkets; souvenir shops sell locally-produced nougat, jam, wine and liqueurs, and bistros serve seafood platters, fish soups and traditional dishes like fenek (rabbit, either stewed or grilled and marinated in local wine and garlic). I prefer to pit-stop in Gozo’s idyllic villages, which are peppered across the island’s hill-tops, and share similar ingredients: a pjazza (square), a pretty church, an English-style red telephone box and a few stores and eateries. Over a cappuccino in Xaghra, I eavesdrop on my fellow café patrons – a 40-something British couple sipping ice-cool beers and discussing stories from the Times of Malta newspaper (there’s one about a proposed Malta-Gozo tunnel link, and another regarding a futuristic archipelago-wide rail system). Nearby, a quartet of elderly Maltese men play cards and puff on cigars. Every now and then someone hares past on a Vespa. I ride five more minutes to find the most hallowed of Malta’s megalithic relics. Dating from 3600BC, the Ggantija temples are said to be the oldest free-standing structures on Earth. World Heritage-listed by UNESCO, they’re around 500 years older than the Egyptian pyramids (but, alas, not quite as photogenic). Like Malta, Gozo has a dramatically craggy coastline, dominated by plunging cliffs and gouged with inlets and grottos. Lording over the yellowy-red sands of Ramla Bay, Gozo’s nicest beach, Calypso’s Cave is soaked in Greek mythology. Local lore claims this is where the nymph Calypso kept Odysseus as a ‘prisoner of love’ for seven years in Homer’s Odyssey. I leave the serene Gozitan port of Mgarr in a brightly-painted taxi boat. Streaking through bluey-green waters, we’re heading to Comino, an island so peaceful it makes Gozo seem like Manhattan. The tranquillity isn’t immediately obvious, however. My boat – along with dozens of other vessels, including pseudo-pirate fleets from Sliema – docks at the Blue Lagoon, a breathtakingly clear channel of turquoise that’s warm enough to bathe and snorkel in most of the year (though the water’s a bit nippy on my April visit). Away from the hypnotic lagoon with its sunbeds, deckchairs and burger vans – and the island’s nearby solitary hotel – Comino feels wild and desolate; blanketed in rocky landscapes, and threaded with silent trails that skirt past farms, crops and wildflowers. I tip-toe along precipitous cliffs lashed by powerful waves and, further out, eye scuba divers bobbing about (visibility levels in Malta’s seas are some of Europe’s best). I scale the bulky St Mary’s watch tower, a cliff-top defence post built by the Knights of St John. (It was the Chateau d’If fortress in the 2002 flick, The Count of Monte Cristo.) Glancing out at the Mediterranean, my imagination stirs as I think about all the ships, and people, who’ve passed by down the centuries. The era of pirates and colonisers may be over, but the Maltese islands retain a magnetic, enduring attraction. Emirates has daily flights to Dubai from Sydney, Melbourne, Brisbane and Perth, with daily connections (three direct, four via Larnaca, Cyprus). Return fare ex Sydney from $1808. You can also fly from London with Easyjet and Ryanair from around $60 one way. Summer (July–August) is often hot and crowded, and winter (January–March) can be cool and wet. Consider April to June or September to December for ideal weather.